Leckhampton Hill contains many natural and quarried rock outcrops as well as gravel pits and landslip features on the top and the slopes of the Cotswolds scarp. The following map shows the area of significant geological interest. The key value of the geology of the area is the potentially complete exposure of the whole of the Lower Inferior Oolite formation in one outcrop area – a feature almost unique in the Cotswolds. The rock exposures are all classified as nationally important and the landslip and gravel sites as Regionally important. The site exposes a 60 metre section of Jurassic sediments. These rocks were laid down in a shallow marine environment some 165 – 170 million years ago. 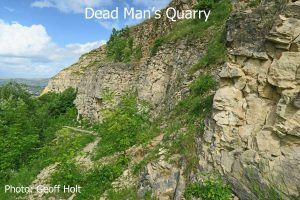 These rocks exposed in the quarries on and under Leckhampton Hill, are a thick series of limestones that extend along the Cotswold scarp. They are important for the fossils they contain and the evidence of past conditions and processes they represent. 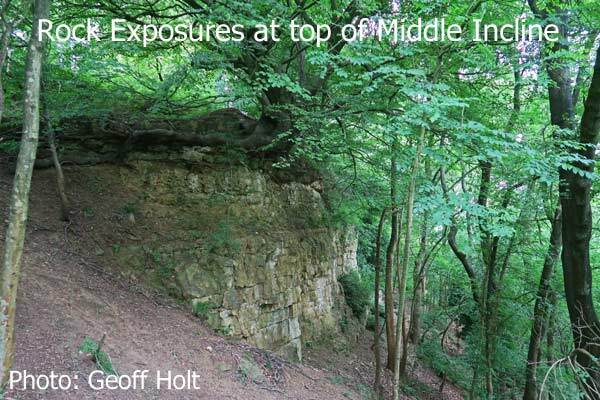 The exposures cover over 1 mile of broken outcrop and are predominantly within the Cleeve Cloud member (Lower Freestone). The main cliffs rise from 720ft at the top Whitby Mudstone (Upper Lias) to 955ft at the top of the cliffs within the Notgrove Member. The cliffs are formed originally by the erosional retreat of the Jurassic outcrop in the Severn Vale during the Tertiary and Quaternary and have been modified by quarrying practices since Roman times. 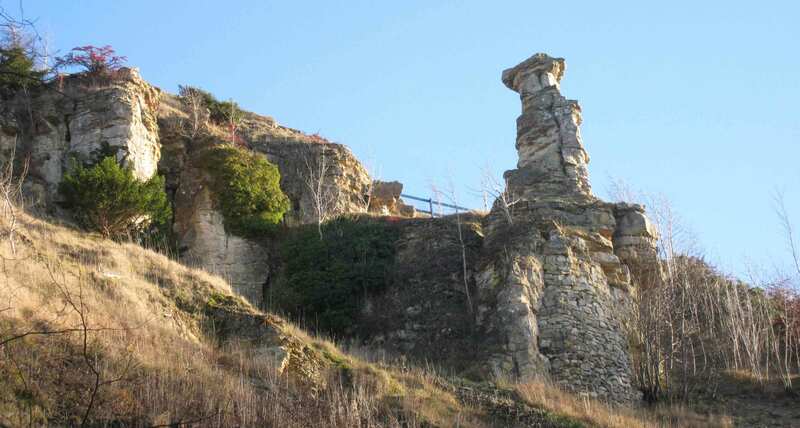 The largest impact came between 1800 and 1927 when massive stone extraction works took place. The Devils Chimney (a “quarryman’s Folly”) is a result of quarry working. The geological strata of the site are almost horizontal with a slight dip towards the south-east. 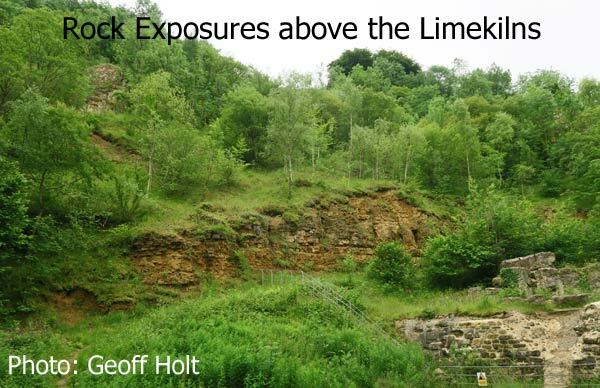 There is also a normal fault at SO 9475,1845, downthrowing to the northeast by about 10 m. The base of the Inferior Oolite (the limestones) is at the same height as the old limekilns at SO 9490,1855. The outcrops on the top of the hill along the cliff edge are of Gryphite Grit and the Upper Inferior Oolite sections are only seen further back in Brownstone. The lower slopes in the eastern part of the site exhibit several landslip features along with Quaternary slump deposits (20,000 years to 5 million years ago). These are seen in the quarries marked on the above map. There are also examples of eroded joints and cambering in these quarries, which represent more recent movements in the hillside. 1. 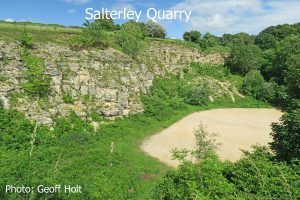 Salterley Quarry, also known as Wagon Quarry. This old quarry at the northern end of the site provides a good exposure through the Cleeve Cloud Member and a small section of Crickley Member at the base. The section shows about 18m of cross bedded oolites with a small fault at its northern end. These old quarried sections are all set within the Cleeve Cloud member, but do show a “False Bedded” horizon. This is one of the older quarries used with the first tramroads. It has old scars in the Scotsquar Member (Upper Freestone) and may have an old adit. This is the most recent of the old quarries and exposes a sequence from the mid Cleeve Cloud (Lower Freestone) Member through to the Lower Trigonia Grit Member. It has been regularly logged and published on and is one of the most important sections on the site. This is another very important exposure exhibiting the lowest 12 metres of the Inferior Oolite (Birdlip Limestone). Whilst it is a “Type section” it is also the only place where these beds are exposed (incompletely) in the SSSI. The limestones range through oncolites, sandy limestones and oolites. These scars represent the visible faces on the hillside. They cover some 150ft (45m) of section through the Oolites of the Cleeve Cloud Member (Lower Freestone) Scotsquar, Lower Trigonia Grit and Gryphite Grit members. They allow for an excellent view of these massive rock units in only a few broken exposures. An important east-west fault, throwing some 13m northwards, is exposed at the western end. This is the remains of a once extensive shallow quarry on top of the hill. The exposures around the edges show the Gryphite Grit, Notgrove Freestone, and Upper Trigonia Grit Members. There is good access to these beds. The limestones are fossiliferous and weathered. This is one of the gravel/scree pits dug to build the inclines from the tramroads on the Hill. These pits still show the slumped nature of the Pleistocene head. This is one of the larger stone/scree pits dug to build the inclines on the hill. There may have also been building stone extraction. These pits still show the cambered/faulted nature of the scarp edge with the Cleeve Cloud member faulted down the cliff against the Lias. This quarry exhibits a section of Cleeve Cloud Member and Scotsquar Oolites (Lower Freestone to Upper Freestone). These beds, however, exhibit differing faces and thickness from those to the west, and allow for detailed log comparisons to be made. The outcrops also show excellent cambering structures and rotational fault movement. These are a series of low bluffs and crags along the top of the hill that expose the upper Buckmani Grit and Gryphite Grit. The interest here is inherent in the rock types exposed in the quarries mentioned above. The variation in the limestones, their content and thickness, is of immense scientific importance. The palaeontological interest of these sections is also important. The age dating of the various members and formations relies on the presence of key ammonites, some of which have been found in these quarries. 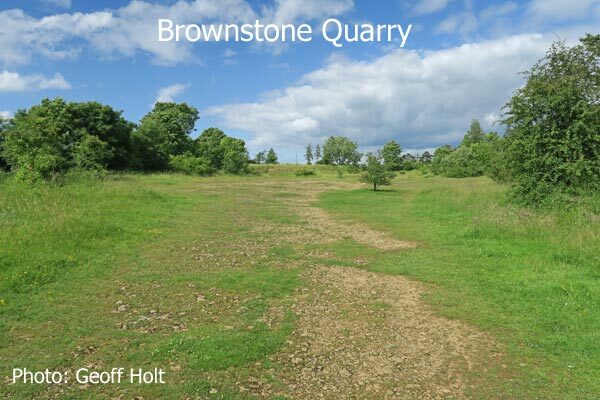 They are also a rich source for brachiopods and bivalves, which proliferate in the Leckhampton Limestone, Crickley Limestone and Scotsquar Limestone as well as the upper members exposed in Brownstone Quarry. In these sites the resultant scree is rich in fossils, lists of which are found in the many reference texts in the bibliography details. 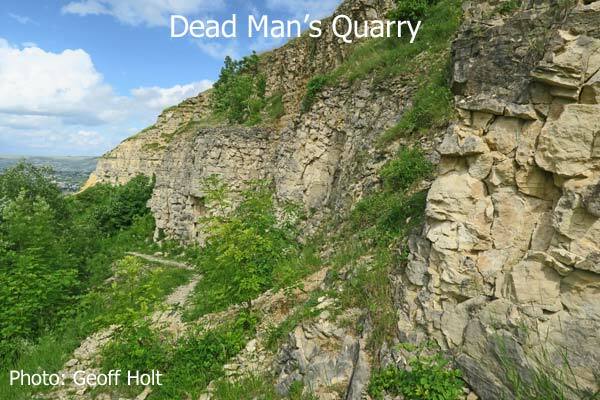 Important collecting sections occur in the Scotsquar Member in Dead Man’s Quarry, the Salperton Limestone Formation in Brownstone Quarry, the Leckhampton Limestone Member in Lower Limekilns Quarry and Lower Trigonia Grit /Gryphite Grit Members in Upper Limekilns Quarry. The only significant fault is a normal fault towards the northern end of Dead Man’s Quarry, at SO 9475,1845, downthrowing to the northeast by about 10 m. This is aligned along the important late Jurassic fault trend. There are also sites with static landslips and gravel and head deposits from the late and mid Quaternary. These are still poorly studied in this area, but remain as potentially important sites for future research. There are numerous examples of eroded joints and cambering in the main quarries. These represent more recent movements during the late ice age and Holocene. These features are seen exposed in Daisybank Quarry and Charlton Kings Quarry. The landforms to the south of these two quarries indicate that they are the result of other compound landslips. The key sections are Lower Limekilns, Upper Limekilns and Dead Man’s Quarries. The presence of key reference/type sections and their palaeontological importance is of significant interest. 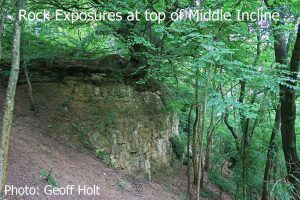 The outcrops and features listed above are considered to be the best complete site in the Cotswolds for rocks of this age. This is probably the most visited Cotswold site for local and national geologists on account of its importance and access. 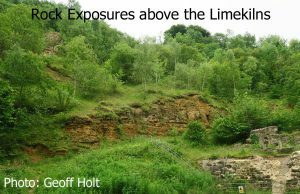 Articles on the geology of Leckhampton Hill can be found on: page 1 of FOLK Newsletter Issue 17 Autumn 2004; page 3 of FOLK Newsletter Issue 13 Autumn 2003.